Srila Prabhupada became a student of philosophy at the Scottish Churches’ College in 1916. It was a prestigious college. In 1918, when he was in the third year of his college, his father Gour Mohan De got him married to Radharani Datta. In 1920, Mahatma Gandhi announced the non-cooperation movement, to fight against the British through non-violent means. The call was to give up English education, English court and English-manufactured goods. Many people accepted his call and joined the movement. Influential leaders surrendered their honorary posts and titles. Motilal Nehru, Rajendra Prasad, C.R. Das, Vallabhbhai Patel, and C. Rajagopalachari were some of them. Motilal Nehru, the father of Jawaharlal Nehru was a very rich lawyer earning $500 every day. Mr. C. R. Das, another lawyer, was earning $50,000 every month. They renounced everything and joined Gandhi’s movement. Gandhi appealed to his countrymen to reject all foreign cloth and wear only khadi produced from India’s own cottage industry. He organized public meetings and asked people to come forth and reject their imported cloth. On the spot, people would throw down heaps of foreign cloths, and set them ablaze in a great bonfire. Students came out of the government educational institutions. Abhay Charan was one of the students who gave up his English education and joined Gandhi’s movement. He started wearing khadi. But in 1922, Abhay Charan met his spiritual master, Bhakti Siddhanta Sarasvati Gosvami Prabhupada and this changed the course of his life. A close friend of Srila Prabhupada, Narendranath Mullik, insisted he come and meet a sadhu from Mayapur. Initially, Srila Prabhupada was reluctant to go. There were many bogus sadhus and Srila Prabhupada had very bad experience with them. But his friend insisted. Together they entered the ashrama where, sitting with his back very straight, they found Srila Bhaktisiddhanta Sarasvati, a studious looking man wearing sannyasa robes and small round spectacles. Srila Prabhupada and his friend both bowed down on the floor before him. While the two young men were still rising and preparing to sit, and before any introduction had occurred, Srila Bhaktisiddhanta immediately said to them: You are educated young men. Why don’t you preach the message of Krishna all over the world? Srila Prabhupada could hardly believe what he had just heard. They had not even exchanged any words, yet this sadhu was telling them what they should do. He asked him: But who will hear your message, so long as we are a dependent country? First India must become independent. How can we spread our Indian culture if we are under British rule? Srila Bhaktisiddhanta replied in a quiet, deep voice: The message of Krishna cannot wait for a change in Indian politics. It is not dependent on who ruled. The teachings of Bhagavad-gita are so important – so exclusively important – that it cannot wait. Walking away from the ashrama Narendranath asked Abhay: What is your impression? What do you think of this sadhu? Srila Prabhupada replied: The message of Bhagavad-gita is in the hands of a very expert person. 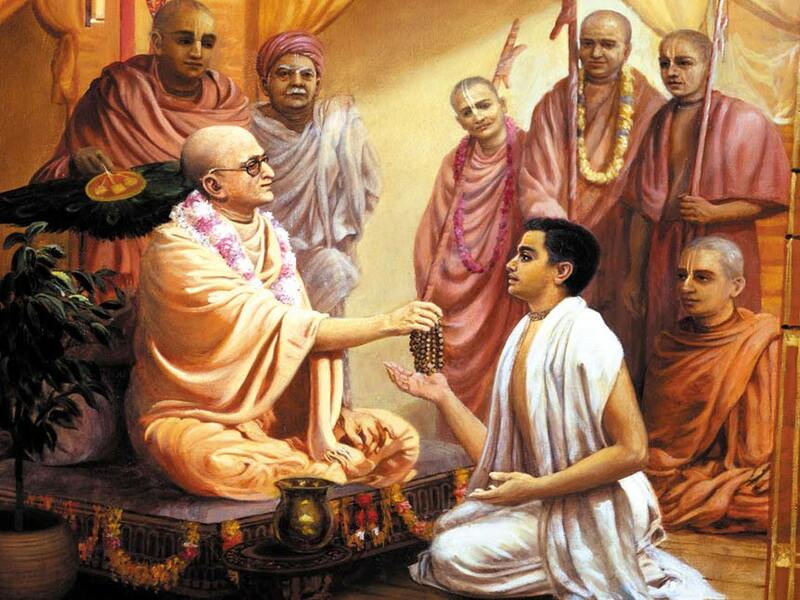 Srila Prabhupada accepted Bhakti Siddhanta Sarasvati Gosvami Prabhupada as his spiritual master immediately and in 1933 he took formal initiation from him.